Whether it’s reporting for the first day of school, asking somebody out on a date, going to work for a new employer or figuring out how to use a new smartphone, starting a new endeavor can be quite challenging. So it is for Dividend Growth Investing, too. 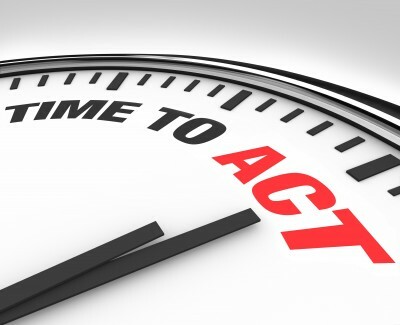 Once I decided several years ago that building a reliable and growing income stream for my eventual retirement made sense for me, I had to actually start doing it. Well, starting an investment portfolio from scratch can be daunting, intimidating and nerve-wracking. So I took my time, did considerable research and tried to learn from DGI proponents I respected – such as Daily Trade Alert’s own David Van Knapp. If you haven’t checked out Dave’s Dividend Growth Investing Lessons already, you should. Even a veteran of the strategy will find it useful, and it is must reading for a newcomer. One kind of “DGI newbie” is the young person who is just getting started as an investor and believes Dividend Growth Investing could be the right way to secure his or her financial future. Another is a person who has been investing for years, perhaps buying mutual funds in his or her 401(k) plan and IRA, but has decided to switch to an income-centric, individual-stock strategy. That investor could be in his/her 40s or 50s (as I was), or a much older person who is approaching retirement or already retired. Twice a month, DTA will make $1,000 in cold, hard cash available for me to invest on its behalf. I will choose each company for the portfolio, and I will write an article about each selection. I will execute each purchase and provide proof of each transaction. In addition, I will maintain and monitor the IBP, reporting periodically on its progress. As time goes on, I will do some selling if I believe it is warranted, and I always will explain my reasons. The IBP’s first investment will be revealed in an article scheduled to be published Saturday, Jan. 13. I expect to execute the buy on Jan. 16, and an article detailing the process will be published the next day. Two weeks later, about $1,000 worth of another company will be bought. And so on, and so on. Build a reliable, growing income stream by making regular investments in high-quality, dividend-paying companies. The secondary goal is to build a portfolio that will experience solid total return, something we believe will occur organically because of the excellent companies owned. Build a portfolio that will produce at least $5,000 in annual dividends within 7 years of the IBP’s inception. Many investors will have a longer time frame in mind. Indeed, DGI is a long-term strategy that truly bears fruit after years (or better yet, decades) of compounding. Nevertheless, we are realistic enough to know that this project might not last for multiple decades, so we are choosing a shorter time frame as the Income Target. The following table shows how the IBP’s income stream (“Dividends”) can grow over time. It assumes 5% annual dividend growth and 2.5% yield – numbers we consider extremely conservative. In Year 1, $24,000 invested at a 2.5% yield would produce $600 in projected dividends. That $600 would grow 5% annually. “Drip” refers to new assets purchased by reinvested dividends – essentially, dividends from dividends. “New Div” represents the dividends the IBP expects to bring in via the following year’s $24,000 investment. 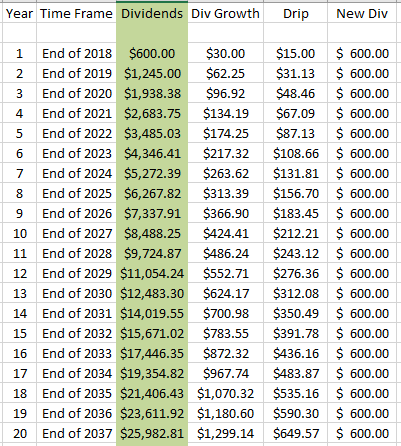 The table looks ahead through the end of 2037, showing how a “forward income stream” of nearly $26K will have been produced 20 years from now. But again, for the sake of this project, the stated Income Target is at least $5,000 annually by the end of 2024. Note that when discussing income for the purposes of the IBP, the reference is to “projected” or “forward” income. 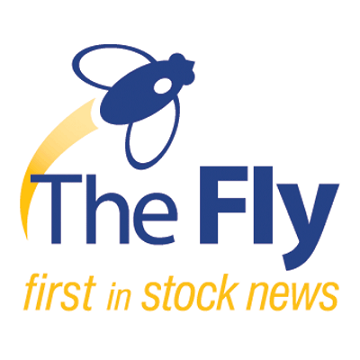 For example, Boeing (BA) recently announced a 20.4% increase to its quarterly dividend, from $1.42 to $1.71 per share, with the first payment to be made March 2. So an investor who owns 100 shares today can expect to receive $684 in income in 2018. That forward income is what is included in the “Dividends” column of the table above. All investment funds for the IBP will be provided by Daily Trade Alert. 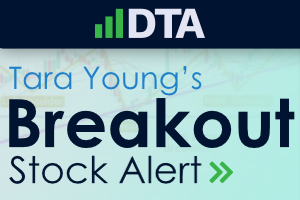 Twice monthly, DTA will make $1,000 available to purchase stock, allowing for the initiation of new positions or additions to existing holdings. This commitment from DTA is open-ended; however, Daily Trade Alert can increase or decrease the funding at any time, or eliminate it entirely. 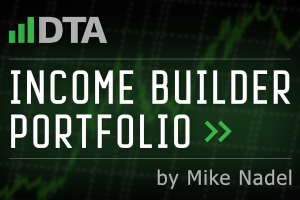 DTA will retain all profits and income produced by the portfolio, and it also will incur any losses. Assess each company’s business model; dividend growth history; “moat” (competitive economic advantage); financial strength (through metrics such as earnings, revenue and free cash flow); and other readily available data. Because the IBP will be held in a taxable account, potential tax consequences will be considered before buying. For example, companies from foreign countries that levy withholding taxes are less likely to be considered. Stocks will not be shorted. Margin will not be used. The IBP will not use options, futures, derivatives or similar trades. The IBP is not expected to include ETFs or mutual funds. A company’s valuation will be considered before each purchase, but it will be a secondary concern to the perceived quality of the investment. An investor making sizable additions to a large, established portfolio might be more concerned about valuation. The IBP, however, is a DGI newcomers’ portfolio that will be built over time through regular $1,000 purchases – similar to the concept of dollar-cost averaging. 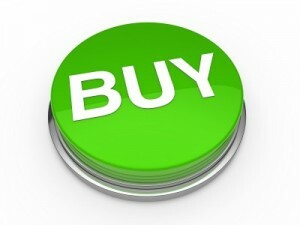 When trying to decide between two similar companies, the more fairly valued stock usually will be selected. Schwab will house the IBP account, and like most major brokerages it offers no-cost dividend reinvestment. The IBP will not own more than 50 companies. There is no minimum yield requirement. Nor must a company have been growing dividends for a certain number of years. This is a DGI portfolio, however, so yield and income-growth history will be strongly considered during the stock-selection process. After the IBP has been in place for at least a year, no company will be allowed to produce more than 10% of the portfolio’s income. Similarly, no more than 10% of the portfolio’s value will be held in any single stock. The portfolio will be diversified across sectors, industries and dividend characteristics (yield, growth rates, histories). The following graphic, snipped from Fidelity brokerage’s account analysis page, demonstrates sector diversification in a mature DGI portfolio I have been managing for several years. There are fundamental changes to its business model or viability, or to its industry. It reduces, freezes, suspends or eliminates its dividend. It is going to be acquired by or merged with another company. 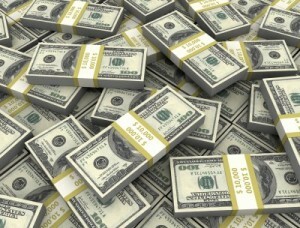 It is going to buy another company or to spin off businesses it operates. IBP updates will be presented in Daily Trade Alert articles several times per year. This business plan will be reviewed annually. As the portfolio grows and/or as situations change, amendments might be deemed necessary. We understand that many DGI newbies, especially younger ones, will not have $1,000 available to invest twice a month. After all, $24,000 per year is a pretty big chunk of change. No sweat. Whether you have $200 per month to invest or $200,000 or anything in between, the principles will be the same. For that matter, we are not suggesting fellow investors buy the exact companies I will be choosing for the Income Builder Portfolio. This project is about demonstrating the process of building an income stream through Dividend Growth Investing, discussing concepts and presenting investment candidates for further research.